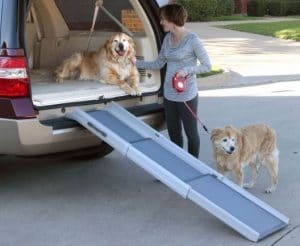 If you’re looking for a dog ramp for car, SUV or truck, you need to know the best features on each. There are different lengths of ramp, ‘foldability’, weight and surfaces available. Dog ramps have developed a lot over the years. They come in so many different designs you’re sure to find the perfect ramp to suit your vehicle and your dog. But be careful, there are some bad ones that could even injure your dog if you get the wrong ramp. See the “Quick Links” on the right to jump to a section! This is one of the most popular dog ramps because it is lightweight, affordable, strong and durable. There are so many different reasons for buying a dog ramp. You may have an elderly dog, perhaps your dog is about to have surgery or it could be because of a knee injury. Personally, I prefer using a dog ramp on my car because I know it is bad for my dog’s joints to be always having to jump up or down from that height. It puts unnecessary pressure on the knees, hips and ankles. I often take my dog in the car so we use a dog ramp daily. If you know you’ll use a dog ramp for car, SUV or your truck frequently it’s worth getting one that is easy for you to lift and store. 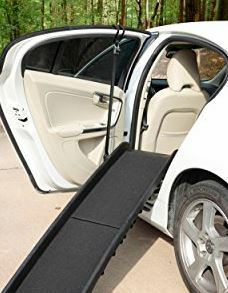 You’ll probably want to store the ramp in the vehicle itself so you need to measure the length and ensure it’s not too heavy for you to lift in and out. Some folding dog ramps include a latch to keep them together when not in use. Another important feature is the surface of the dog ramp. You need to ensure it is suitable for dog’s paws. If you need a dog ramp for SUV or truck then your need to take into account how steep the gradient will be on the ramp. The higher your vehicle, the steeper the ramp for your dog. There are longer ramps available for greater heights. If your dog is young, fit and healthy this may not be a big concern. If your dog is elderly you may need a more gradual slope on the ramp. what is the maximum length for storing the ramp in your vehicle? how high is the vehicle, do you need a longer ramp to reduce the gradient? is the surface of the ramp safe for your dog’s paws – won’t scratch your dog? will the surface stop your dog sliding off the ramp, avoiding risk of injury? do you need a free standing dog ramp? is your priority a lightweight ramp – who will be lifting it? 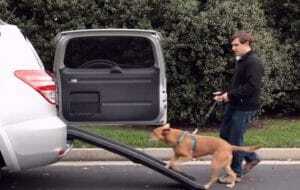 do you need a car ramp for a large breed of dog – what weight capacity is required? Here are some of the best dog ramps available for cars, SUV and trucks. Once you get a dog ramp you’ll wonder how you lived without one. They make a huge difference to the health and happiness of your dog. This dog ramp is very good. Don’t let its appearance fool you. It looks basic and boring! For the price you get a very convenient, good quality, dog ramp with lots of features. But the advantage of this dog ramp for car or other vehicles is in the surface your dog walks on. A lot of dog ramps are not suitable because of their tread surface. The surface on this PetSTEP Original Folding Pet Ramp is unique. When I first saw this dog ramp I thought the surface was part of the molded plastic. It’s not. It is a soft rubberized non-slip walking surface. Your dog will love it. And it’s safe. The total weight of the ramp is 18 lbs. 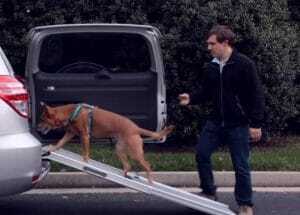 This dog ramp is perfect for the car because it folds in half and has a built-in handle for lifting. It also includes a latch to keep the two sides of the ramp together when folded. This is an advantage if you need to store it on its side and you don’t want it springing apart. You also get a non-slip edge to place it onto your vehicle. This folding pet ramp uses advance composite plastic construction and can hold dogs up to 500 lbs. It’s perfect for large breeds. One of the advantages you get with this plastic construction is that it won’t rust or corrode. You can clean it with soap and water easily. ✅ To see the current price on this PetSTEP Ramp, Click Here. If you own a bigger vehicle it is even more important to use a ramp to get your dog in and out. The higher a dog has to jump up or down to a vehicle, the more strain is put on their joints. This next dog ramp is extra long. It is a great dog ramp for car, SUV or truck but the most important feature for dog ramps for SUV or trucks is that they are longer to reduce the gradient your dog has to walk along. If the gradient is too steep this can be unsafe for an older dog or for a smaller dog who can cope with steep slopes easily. This Solvit PetSafe Extra Long Dog Ramp (see above) is telescoping to make it easy to load into the vehicle when not in use. For the price you get a sturdy yet lightweight dog ramp. It features an ultra stiff design to ensure a sturdy walking surface for your dog. It can take dogs up to 300 lbs. The tread surface is a non-slip high-traction walking surface to assist dogs with mobility issues. Because this dog ramp is telescoping it lets you adjust the length to your needs. It can be used at any length between 47 and 87 inches. This is an advantage over folding pet ramps which can only be used at one length. If you’re looking for a dog ramp for car or more particularly a SUV or a truck then this is the one for you. This pet ramp is constructed from a combination of aluminum and plastic keeping it strong yet light weight. If you’re looking for the best dog ramp for car or truck you may be surprised to hear that there are free standing dog ramps available. You’ll love the versatility of these ramps. Not only can you use them with a vehicle but for inside the house with furniture like a bed. Being free standing you can use these anywhere as long as the height is right. This Pet Gear Ramp is 23 inches tall. If you need a free standing dog ramp for car, SUV or truck there are several models to choose from in this brand. Beware of the “slip resistant” surface offered on one of these Pet Gear ramps. A lot of dog parents have been displeased with this surface. It is not recommended. You’ll want to look at the models that offer the “supertraX” surface. This one (image below on left) is suitable for dogs up to 200 lbs with supertraX as the tread surface and this (image below on right) is another one with supertraX for dogs up to 300 lbs. The Pet Gear Ramp for 300 lb dogs has an extra support underneath. It is also a wider ramp for larger dogs. The supertraX tread surface is removable and washable. It is soft enough to allow your dog to get grip with his or her paws without injuring them. 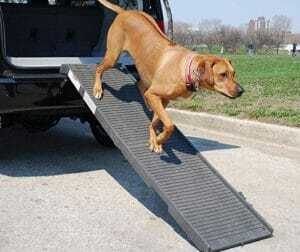 Note: this ramp can be folded and placed into the back of a vehicle but it is more difficult than some of the other dog ramps because it is more bulky. If you’re worried about lifting this dog ramp you may need to look at one of the other dog ramps that do not include the free standing leg, making them slimmer and easier to lift. If storage space is limited in the back of your vehicle you’ll want this Tri-Scope Deluxe Ramp from Solvit. It condenses into a short length for storage. See Today’s Price on this Tri-Scope Folding Pet Ramp. This is a high quality pet ramp constructed of aluminum and plastic. It weighs only 14 lbs. With this telescoping design there’s no awkward folding mechanism. It slides effortlessly together to place into your car. This folding dog ramp (actually telescoping) includes a handle for easy lifting. The tread is a high traction walking surface a bit like sand paper to provide a non-slip surface. This dog ramp can be used at any length between 28 and 70 inches. It’s very convenient if you want to use it in for different purposes at different times. For example, you can use it to cover one or two stairs at your home and later you can use it as a dog ramp for car or truck. Features: the tri-scoping design allows this ramp to collapse down to 28 inches length for storage, making it much shorter than other ramps this size. Includes a carry handle and snap strap to keep the slide closed when not in use. This affordable pet ramp is a good price, lightweight, durable and stable. If you’re looking for a dog ramp for car, SUV or truck that is lightweight yet practical then you must take a look at this one. It weighs only 10 lbs yet it is still a full size pet ramp. It can hold in excess of 150 lbs capacity. This is a folding style of dog ramp. The pet ramp is constructed of sturdy plastic making it easy to clean or hose off. The dog ramp includes a high-traction walking surface. It has four rubber feet to keep the ramp stable while in use. It also includes a safety release catch to keep the ramp together when stored. CLICK HERE to see more details about the Solvit Side Door Adapter. If you’re looking for the best dog ramp for car, SUV or truck this one is very affordable. Rather than avoiding buying a pet ramp because of the cost, take a look at this one and get a good quality lightweight dog ramp which is affordable. If you need to use this ramp for side door entry you can purchase a separate kit to support the edge of the ramp (see the photo on the right). It doesn’t cost much but it’s really handy if you want to use the ramp this way. This side door adapter kit can be used on many of the Solvit brand dog ramps. Features: includes catch and indentation handle, affordable price, lightweight, easy to clean/wash off. ✅ Click Here to see Today’s Price on this lightweight dog ramp. This ramp is similar to the model shown in numbers 2 and 4 above. However, if you don’t need the extra long model you don’t need #2 and if you don’t need the tri-fold for storing it at a shorter length then you don’t need #4. This is the telescoping deluxe ramp from Solvit PetSafe. It telescopes two parts. The folded length is 39 inches for storing. It provides 17 inches of width for a larger dog to feel comfortable walking up the ramp. This ramp holds over 400 lbs to accommodate large breed dogs. It includes a carry handle and can be latched when not in use. Features: made from aluminum and plastic to keep it lightweight, takes large dogs, includes handle and latch. ✅ Check Today’s Price on this lightweight dog ramp. Most dogs are resistant to use a dog ramp when they first see it. This is not unusual. But it’s not an obstacle to using one! With a little bit of coaxing and training you can get your dog using it very quickly. Once they get the hang of it, they love going up and down their ramp. Place the new ramp flat on the ground and have your dog walk along it by encouraging with treats. If your dog is highly resistant to the ramp you can place your dog’s favorite blanket on the ramp to make it seem familiar. This will also help if the surface of the ramp is unfamiliar to your dog. Many of the non-slip surfaces used on ramps will feel different for your dog the first time. Once your dog feels comfortable walking on the ramp on the ground, place it on the vehicle where it will be used. Encourage your dog to walk up the ramp using treats as an enticement. If you have more than one dog, get the more confident dog to walk up the dog ramp first to make it seem more normal for the other dog. once your dog has walked up the ramp once, try walking down and up again a few times to reinforce the activity. Keep rewarding with treats at this stage. Once your dog is happy with this experience on the ramp you can stop using treats. 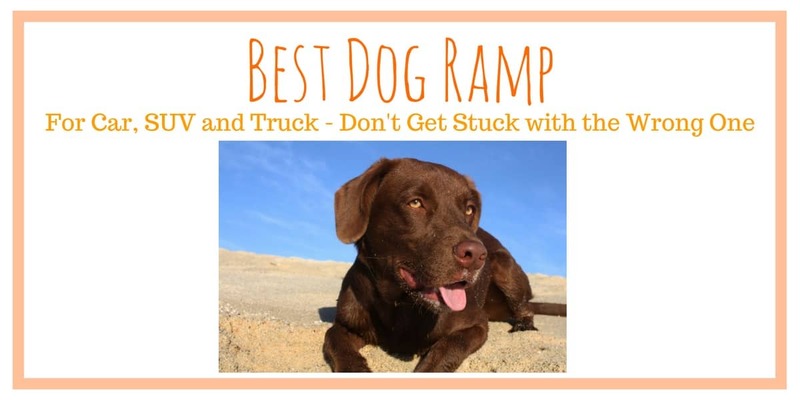 If you plan to use the ramp less frequently you may need to get your dog to practice using it more often at first even if you’re not needing to go anywhere in the car. It is important to keep your dog familiar with the ramp until it becomes a regular part of their daily life. ⇒ Do you have a large breed or dog? See the best extra large dog beds here. ⇒ Is your dog misbehaving? Fight boredom with these cool dog toys. ⇒ Does your dog eat too fast? You need a slow feeder bowl fast.